How Does Anxiety Increase the Chance of Developing Dementia? Dementia is a multifactorial disorder, which means it develops due to multiple mechanisms ranging from behavioral to hereditary. It’s difficult for any person to avoid all the potential causes of dementia. However, anxiety is one of the biggest risk factors for the development of dementia, and aging adults at risk for dementia should try to lower their stress levels. For years, researchers have noticed a connection between dementia and mental health disorders. 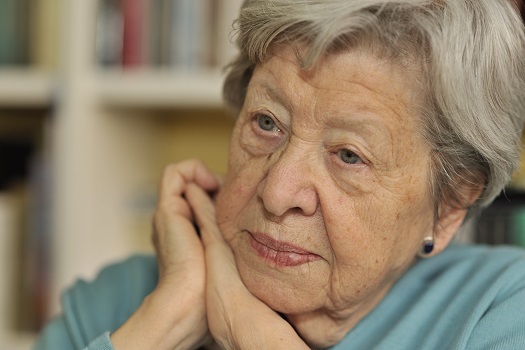 However, it was unclear whether depression and anxiety were simply early symptoms of dementia or independently increased the risk of cognitive decline. Studies conducted in the last decade suggest anxiety is an independent risk factor. People who experience anxiety throughout their lives are more likely to develop dementia. If there’s a connection between anxiety and cognitive decline, it’s probably due to the physiological impact anxiety has on the brain. For one thing, chronic anxiety causes the brain to age faster. When people experience sustained anxiety, it can affect the length of the telomere—the structure at the end of each chromosome. Telomeres are crucial for cell division and the protection of genetic data. When telomeres shorten, it can hasten the cellular aging process, which can decrease the functionality of brain cells. If the brain cells are no longer able to function optimally, it leaves the brain at greater risk for dementia. Family caregivers can benefit from this knowledge for themselves as well. Caring for an aging loved one can be source of frequent anxiety and worry, so it’s important to give yourself time to take a break and rest your mind and body, and a professional caregiver can relieve some of the pressure. Caring for a senior loved one can be challenging for families who don’t have expertise or professional training in home care, but this challenge doesn’t have to be faced alone. Family caregivers can turn to Huntington Home Care Assistance for the help they need. We provide high-quality live-in and respite care as well as comprehensive Alzheimer’s, dementia, stroke, and Parkinson’s care. When people experience anxiety, negative thoughts play on a loop in the brain, obscuring everything else. If this cycle is ever-present, it does more than sap the body’s energy reserves. It can also prevent the brain from retaining information. Thought patterns become locked in these anxiety spirals, and there’s simply not enough space for information retention. Anxiety can also impact sleep quality. When people with anxiety lose sleep due to their mental stress, they don’t give the brain the chance to rest, restore, and imprint the day’s memories, which increases the risk of long-term memory loss brought on by disorders like dementia. If you’re concerned your loved one’s mental health history may put him or her at risk for developing dementia, it might be a good idea to consider adding a professional caregiver to your team to start boosting your loved one’s cognitive health now. Not every senior has the same care needs, which means they don’t all need the same type of senior care. Huntington families can rely on Home Care Assistance to provide individualized care plans to meet your elderly loved one’s unique care needs. Our holistic Balanced Care Method was designed to help seniors focus on healthy lifestyle habits such as eating nutritious foods, exercising regularly, and maintaining strong social ties, and our Cognitive Therapeutics Method offers mentally stimulating activities that can stave off cognitive decline and delay the onset of dementia. Anxiety isn’t confined to the cycle of negative thoughts in the brain. When anxiety levels rise, the body responds as well. The heart rate increases, breathing patterns speed up, and the senses gain clarity. These are protective measures. The body’s response to anxiety mirrors its response to physical threats. However, the body’s survival mechanisms aren’t meant to be used chronically, and when they are, they can cause long-lasting damage. The marked increase in blood pressure is helpful when facing a momentary threat. If it lasts for too long, it can damage the blood vessels that send oxygen to the brain. When the brain doesn’t get enough oxygen, it’s more likely to develop cognitive disorders. Caring for a loved one with dementia can be challenging, especially if your loved one has experienced anxiety or depression throughout his or her life. Professional caregivers have the training and knowledge to help your loved one manage both the physical and mental effects of dementia. If you’re looking for reliable dementia care, Huntington Home Care Assistance offers high-quality at-home care for seniors who are managing the challenges of cognitive decline. We offer a revolutionary program called the Cognitive Therapeutics Method (CTM), which uses mentally stimulating activities to boost cognitive health in the elderly. CTM has proven to help seniors with dementia regain a sense of pride and accomplishment and learn how to engage with others in an enjoyable way. Trust your loved one’s care to the professionals at Home Care Assistance. Reach out to one of our compassionate Care Managers today at (304) 521-2909.